April 5k finished!! Wasn’t quite a 5k, it was 2.7 miles. Anyone ever had it be less than what was planned? Race people stated “safety” as a reason for the shortage. I’m ok with that. Safety first!!! Especially after the Boston incident. Know we run faster on race day!!! :). I haven’t picked out a May race yet. Hoping to have that picked out by the of the week. 🙂 My hubby also ran with me!! He doesn’t run in races oftenbecause he see’s paying $$$ to run is ridiculous when you can run for free!!! New running shoes are on my feet!!!! I’ve been fitted in the past, but wasn’t impressed. I decided to check out the Road Runner store in my area to see if they fit people for shoes. I’ve been running in Brooks Glycerin 9 & 10’s for over a year and really like them! My only problem is that the back of my lower left leg aches during the run. I thought I figured out the problem. I switched to a smaller size and that seem to really help. I got a deal on Glycerin 9’s and bought them again in my normal size. Oh no! Lower left leg pain back again!!! My left foot is much smaller than my right foot and sometimes it’s really hard to find shoes that fit comfortable on both feet. After this, I decided to go get fitted because no one should have pain while running!!!! As if!!!! I got fitted at the store with their cool and neat equipment called the “SHOE DOG.” First, you stand on this mat and it reads the pressure on your feet while standing. It tells you how you distribute your body weight. I apparently put most of my weight on my left foot. 53% on m left and 47% on my right. Pretty close to balanced. ( I guess the WII Fit does help :)) It also was able to tell me I have a high arch. Next, they have you run barefoot on a treadmill and videotape you running. They then analyze how your feet/ankle move while running. They are looking at the flexibility of your foot. You are either rigid, flexible, or very flexible. They placed me as a flexible foot runner. Finally, they tell you what type of shoes would work best for you while running. Your either a neutral, stability or motion controlled runner. My “perfect shoe” recommendation was …….stability!!!! The brooks shoes I’ve been running in are for neutral runners. Hmmm could that be my problem? They then custom fit you for orthotic inserts. They actually mold your foot into the insert. Next, over to pick out shoes!!! They have the shoes sectioned to make it easier for you to select your shoes. I was sad to see my brooks in the neutral shoes section. They also recommended size 7.5-8 wide for me. I usually get 7.5 for running shoes and NEVER wide!!! So bigger and fatter shoes!! Nice!! Didn’t think my feet were that wide. The SALESDOG told me it’s to allow for swelling. HUH? My feet don’t swell when I run. Do yours??? Anyways, I’m up to trying anything. They brought out a few pairs of shoes. Can you believe they brought me a pair of Nike’s? Seriously? I would never run in Nike’s. Don’t get me wrong, I love Nike and their brand but not for running. Their shoes are more for “show.” If there ever comes a day that Nike is at the top for running shoes, I may try them. 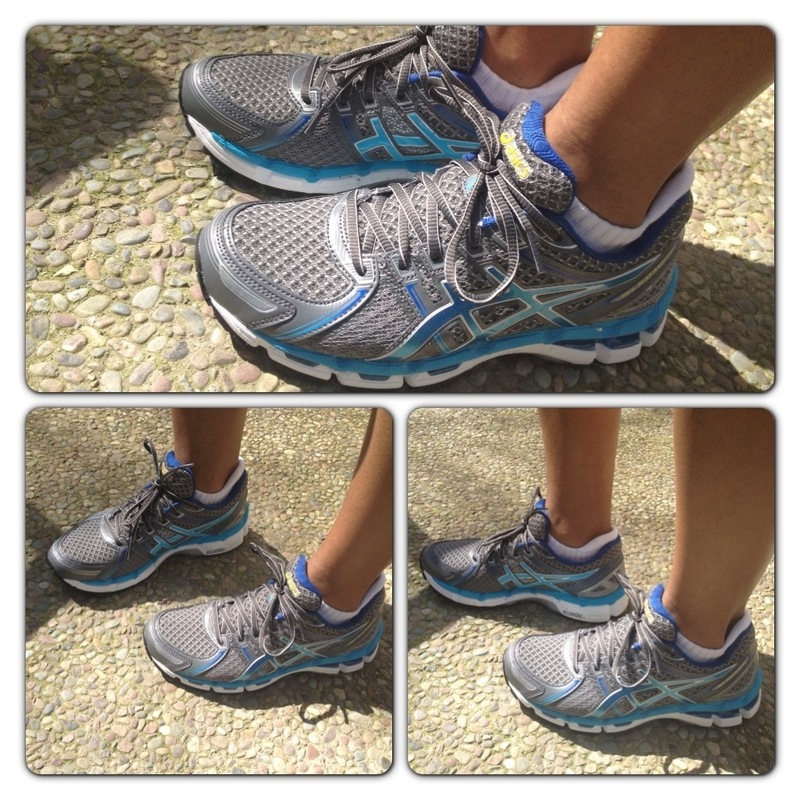 I ended up choosing the Asics Gel Kayano 19. Love them!!! They are comfortable, plenty of cushion, sytlish and absorb impact well. My knee’s & hips feel great!!! I ended up getting size 8 wide. I’ve run 37 miles in them and I think they are too wide. There is too much room in the toe box and on the sides. Of course, my lower left leg aches during the run. Overall they are about the same as the Brooks Glycerin. If I can get rid of the leg pain, I’ll be coasting!! Luckily the Road Runner store allows exchanges & returns within 90 days of purchase. I think that is a nice perk!!!! I plan on exchanging them for the size 8 B width instead of wide E because I need that leg pain to go away permanently and I don’t need such a wide toe box. I will update after I exchange and see if the back leg pain will go away. Well today is sunday and I ran the Nike virtual race yesterday before heading off to work. I work 12hr shifts and a co-worker was nice enough to work the first 4 hrs for me so I can run this race. We call those “princess” shifts! Love those 4hr shifts. The race went really well. I wore my long sleeve shirt that I received in the mail from Nike. Nice shirt! It was chilly for me to start the race….45 degree’s. My rule is 50 degrees or higher to run. Your probably rolling your eyes…… So if I lived where it was colder, I would learn to run in cold weather. Living in Northern California, it doesn’t get that cold so why even do it if you don’t have too? I did a trial run monday and mapped out my route. That made it easier to concentrate on running because I didn’t have to worry about where I was going. My goal was to finish under 59:00. On monday, I finished it 59:03. Yesterday, I finished it 57:55!!! The last mile I was chugging. There was a runner in front of me and I was trying to catch her!! She turned before my finish line, oh well. It worked because I finished under my goal time and PR from my first 10K. I use to run and not care about pace/time etc. I would just cruise along. Every since Nike Women’s Marathon, I’ve had this goal in mind to pick up the pace. My current race pace goal is under 9:30/mile. I know a lot of you run wayyyy faster than me and that’s ok, I’m not sure of my end goal for pace. I’m sure that will come with time. I’m actually liking trying to pace myself faster because it pushes me harder when I’m running. My next race is a 5k in April. I decided not to do that half marathon for this race. I heard it was a boring route. 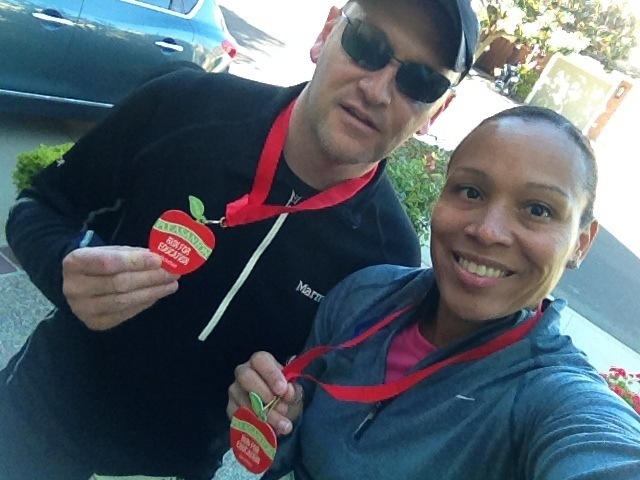 December 2012 – Didn’t run the Double Road Race! 😦 That morning it was raining! Not an excuse but this time it’s an excuse. Just got over pneumonia 3 wks before, I didn’t think it would be smart. I’m a nurse and I know how bad getting sick can be. Next year for sure!!! January 2013 – Recoup time!! My friend had asked me before the NWM to run a half in February. When I went to register, I saw they had a 10k also! I decided to run the 10k! Again, having just recently had pneumonia, thought it was smart not to push myself. I would have about 4 wks to train. See a pattern here? I totally baby myself. I hate set backs and if I can hopefully control them, I will. February 2013 – Completed the Brazen Racing Bay Breeze Race 2/16 10k. Time 59:27 6.34 miles. That morning they measured the course a little longer. My first 10k! Not bad! I missed top 10 in my age group by 20 seconds! I think this is why they say you race against yourself because if I had known, I would have kicked it in high gear the last mile!!! This was an up and back run! I’m not a fan of up and back! I ran one and hated it. We were all squeezed on this small sidewalk. I must say, they did a really great job running this race. Very organized and not crowded after the first 3/4 of a mile. I will definitely race in another one of their races. March 2013 – Decided to start a photography business. I’ve been into photography since the film days. 🙂 Love it!!! Why the change from hobby to business? Been thinking about it for a while! I think it clicked while I was taking basketball pictures of my son’s high school team this year. I started off just doing my son’s team (freshman), then players and parents were asking me if I took pictures of their kids. So I started taking JV and Varsity pictures. Everyone absolutely loved it and I’ve gotten such positive feedback, I decided to finally take the step. It will just be part time for now. I already have plenty of equipment, it’s a matter of making it official!!! Also this month, I sat down and decided my racing goal for this year will be to run one race a month. Remember I’m new to running. I’ve been trying to kick up my pace to sub 9:30’s and so far keeping it there!!! 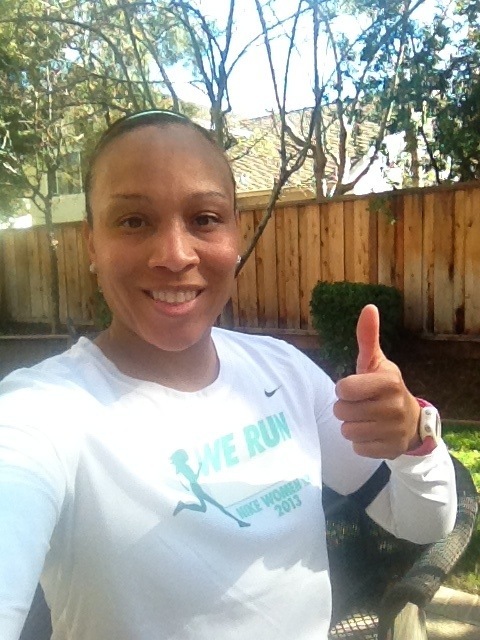 I have a 10k Nike Virtual race this saturday. 🙂 Then in April there is a race for education for my city. I haven’t decided if I want to do the half or 5k. Haven’t really decided my distance preference. So far, I like 10k’s and half’s. That’s about it in a nutshell! I hope this is start to keep up my blog! Sorry I was MIA!!! Double Road Race!! Ever heard of one???? A new sport comes to America Sunday, Dec. 23 in Pleasanton, Calif., with the first-ever staging on American soil of a unique new running competition called the Double Road Race™ (or Double for short). A distance race consisting of two legs — an opening 10K (6.2 miles) leg, followed by a 5K (3.1 miles) leg, with a short break in between, winners to be decided on best aggregate time — the Double is the brainchild of running visionary and innovator Bob Anderson, founder and former publisher of Runner’s World magazine, and an avid runner for 50 years. Wow!! One of my many ads on the right side of my facebook had this race listed. Of course, curious me, I clicked on it and was sold!!! It’s different and I like doing different thing (really?). I’ve only done one half marathon and have no desire to complete a full marathon. Running races like this would be a nice change from the norm. I signed up last week and was one of the first 800 runners, so I get a bag full of cool goodies!! That was about the best thing that happened after I signed up, the worse thing…….I came down with pneumonia. ME! ME!!!! I rarely get sick and I’m a clean freak!!! I had the flu the beginning of last week and by friday I felt better. Signed up for the race and that night I felt like a mack truck ran me over!!!!!! If you can make it sign up!!! I’ve gotten really great advice with letting the “PR” thing go for a bit. I think it may take some time for me. It’s funny because I use to MAKE myself run a certain pace. I tried the negative split idea but never could do it. I would start out 10 min/mi and end up with 10 min/mi at the end. I would look at my watch, see that I was running 9 min/mi and slow myself down. Then after running this last half, I’ve asked myself, why do I do that? Why am I NOT just letting myself run naturally? My last few runs, I have done just that. It has felt great!!! (Except the pace stalking I do) I Let myself run what feels comfortable for me. When I’m done, I’m in the 9 min/mi pace. Not bad. But there I go again, looking at my pace!!!! Even though I looked at it, I just kept running what was comfortable. I probably didn’t look at it as much as I normally do. Anyways, can’t run again until monday. I ran a short run yesterday, cross training day today and I’m getting ready to work 3 12 hr shifts. 😦 I was just off 6 days!!! 😦 Back to work I go. I think running with only my ipod will hopefully be the answer!! !